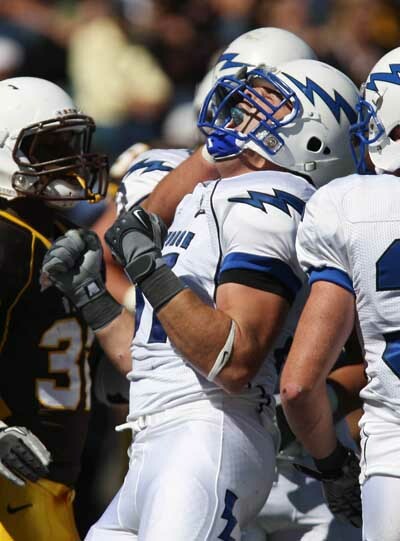 Air Force is now 3-1 after its win today at Wyoming. Quarterback Tim Jefferson (94 yards rushing) put the Falcons ahead for good with a 7-yard touchdown run in the fourth quarter. 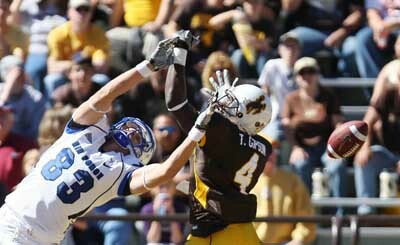 The point-after was blocked by Wyoming’s defense, but Air Force soon forced a turnover to cement the outcome. Air Force trailed going into the fourth quarter, tying the game up early in the period on a 9-yard Nathan Walker touchdown run. For more on the Falcons’ win today, click here. Below: some shots from today’s victory. Falcons defensive lineman Zach Payne reacts after making a backfield tackle. 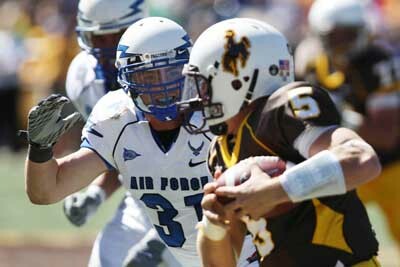 Air Force defensive back Brian Lindsay pursues Wyoming quarterback Austyn Carta-Samuels during Saturday’s game.